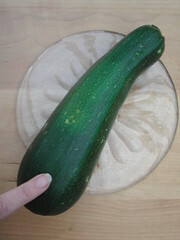 wendy house » Blog Archive » I grew some ratatouille! This scribble was published on Sunday, August 28th, 2011. You can follow any banter on this scribble with the RSS 2.0 feed. You can share your inspired musings after typing the anti spam word near the bottom of the page. But no Pinging because its too naughty. There is a surprising amount of sexuality in this post. I might even go so far as to say it’s borderline pornographic. “I slipped a seed into the sod last April. ” Could be Jilly Cooper writing. I had steak, chips and salad last night – quite tasty, in fact, though not remotely home-grown. My mother’s home-made ratatouille is very nice – though apart from having used a bit of one of my chills once or twice for spice, all shop-bought ingredients. Vegetables, another Wendy House talent. If that were mine, I’d make my veggie lasagne with it. I’ve never read any Jilly Cooper, but she’s a famous writer so I’m geussing that’s a flattering comparison, thanks ExpatEgghead!